The Península de Setúbal is surrounded by the Atlantic Ocean and the rivers Tejo and Sado. The region, located south of Lisbon, is essentially characterised by tourism and large wine farms. From Castelão to Moscatel, this region has always had an important role in the history of Portuguese wines. There are two types of landscape in the Península de Setúbal. One is characterized by vines planted on clay-limestone soils, between 100 and 500 meters. The Arrabida mountain protects the vines from the influence of the atlantic. The other area he represents, about, 80% of the region, includes flat land or gently undulating, rarely exceeding 150 m in height, land consisting of sandy soil is rather poor, ideally suited to grape production high quality. The climate is temperate Mediterranean, with hot dry summers and mild winters and rainy. The annual average relative humidity is between 75% to 80%, reflecting the proximity of the sea. 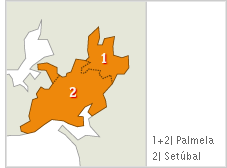 The Península de Setúbal comprises two Denominations of Origin (Palmela and Setúbal) and the designation vinhos regionais Península de Setúbal (Península de Setúbal regional wines). Most of the region’s wines use the Castelão grape in their composition. Castelão is the region’s traditional grape variety and legislation says a high percentage of this grape must be used in the production of DO wines. For example, 67,7% of the Palmela DO must be Castelão. This grape variety is sometimes blended with Alfrocheiro or Trincadeira. In the 19th Century, the biggest continuous vine in the world was located in the Península de Setúbal: about 4000 hectares of vine that belonged to a single producer. Currently, the area occupied by the vine is of about 10000 hectares. The dominant white grape varieties are Fernão Pires, Arinto and, of course, Moscatel de Setúbal. This last one is used in white wines, but also in fortified wines from the Denomination of Origin of Setúbal. Setúbal’s fortified wine produced from the Moscatel and Moscatel Roxo grapes is one of the oldest and most famous wines in the world.